A Lecture at Hillsdale College, March 6, 2013. March 6, 2013. I should warn you before I start that there is going to be a certain amount that is political and even a little that is philosophical in what I am about to say — just so that you don’t get your hopes up too high about something advertising itself as being about more enjoyable things like war movies. It is about war movies, but it is also — at first, and then again a bit later on — about the fact that, in thinking about war movies, I have found it to be impossible to proceed very far without grappling with politics, philosophy and other matters that may seem at first to have little or nothing to do with the subject. I hope you’re not too disappointed. As Zero Dark Thirty, his narrative about the hunt for Osama bin Laden attracts scrutiny, the screenwriter Mark Boal has consoled himself with brouhahas of movies past. Warren Beatty came under fire for Bonnie and Clyde, in which he starred, because it was considered sensationalist and was pilloried for glamorizing violence. Demonstrators protested the depiction of the Vietnam War in The Deer Hunter, and protesters were arrested outside the 1979 Oscars. Apocalypse Now was a cultural punching bag for years during its much-delayed production. All of these films were, of course, judged differently by history. Ah, "history"! History, as you may have noticed in recent years, has developed a habit of judging things in rather predictable ways. In particular, it always seems to be the friend of those who have chosen to call themselves "progressives," and for obvious reasons. For if you believe that what you call "progress" is a law of history, perhaps even the law of history — a belief, known as historicism, that some progressives have taken over from Marxism — then you must also believe that sooner or later everybody else in the world, including those non-progressives who are now so often said to be "on the wrong side of history," will eventually believe what you already believe. It’s must be a comforting thought. Calling yourself a "progressive," therefore, can be another way of saying that you are among the first to see things as the men and women of the future will see them. And how do you know how the men and women of the future will see them? Because you are privy — so, at least, you suppose — to the laws of "history." That assumption can also be useful in explaining, even to yourself, why you believe as you believe today. Who doesn’t want to be on the right side of history? If something may be supposed to be a part of the belief-set of people in the future, then it is only sensible and prudent to make it a part of your belief-set today — not only because it puts you in the forefront of fashionable opinion but also because it protects you from the embarrassment of having to explain to those people of the future why you took so long to see things the way they do — the right way, as history proves. That kind of progressive historicism was implicit in President Obama’s claim — what a long time ago it now seems, though it was less than a year ago — that his views about gay marriage were "evolving." Everybody already understood when he said it that his views must have been evolving in the direction they did evolve in, because that is the only direction they can evolve in if you’re a progressive. Progressives seem to be able to assume that pretty much all of their agenda is already baked in the historical cake, which must be why the President could assure the Iranian "Green Revolution" demonstrators of 2009 that they wouldn’t be needing any help from him because they, too, were on the right side of history. In that case, it seems, history hasn’t yet got the memo. Miss Ryzik’s application of progressive historicism to movie criticism may at first seem just a little incongruous, but it shouldn’t. The politicization both of movie criticism and of the movies themselves has been progressing, too, for decades. Nowadays almost everything written about movies or popular culture by the scholars and academics paid to study such subjects by universities is so reliably progressive, as we now understand the term, that it will seem to ordinary readers already to come from the future. This impression is reinforced by the fact that it is written in a futuristic language only vaguely related to English, a language which is beginning to leave its impression on our own with words like Melena Ryzik’s "narrative" in place of an old-fashioned word like "movie." She is far from being the only person to think nowadays that "narrative" sounds more intelligent and sophisticated than more concrete language. That comes from an essay titled "Redacted: The Heart of Darkness Trope in Representations of Empire" by Liane Tanguay, a Canadian professor who studied under Professor Terry Eagleton at the University of Manchester in England. If it takes that much rhetorical huffing and puffing for her to account for the 1851 Great Exhibition, you can imagine how much is involved in explaining Apocalypse Now and a couple of other movies which, with the help of even more impenetrable jargon, she sees as commentaries, critical and otherwise, on American imperialism. In fact, the very existence of American imperialism — also known as "hegemony" — might have seemed a somewhat dubious proposition for Dr Tanguay simply to assume without the language collaboratively invented for her by the likes of Professor Eagleton and the late Dr Althusser. He, by the way, was a Franco-Algerian Marxist philosopher so brilliant that in 1980 the French declined to prosecute him after he killed his wife. He explained that he was absent-mindedly massaging her neck when he suddenly discovered he had strangled her. It was the sort of thing that could only have happened to an intellectual out of the very top drawer. Before we leave Liane Tanguay behind, I would just call your attention to the scorn she heaps on two other ideas associated with but distinct from the aesthetics of hegemony, on which she also heaps scorn. These are, first, the Victorian "faith in linear narrative. . .as a means of ordering reality" and, second, the Victorian idea of Progress — the "P" is capitalized to underscore her sarcasm. I’ll come back to faith in linear narrative in a moment but, as we’ve already mentioned progress, let’s first consider why she is so hostile to it. The reason, I think, is that it reminds us of the time when the progressives were the imperialists, bringing what they saw as Christian enlightenment and morality to the backward and benighted parts of the world which the new progressives see not as the beneficiaries but the victims of Western power. If they’re not careful, the new progressives could be seriously embarrassed by the bad mistake their Victorian predecessors made in reading the laws of history. Some might even begin to think that they, too, could be mistaken about those laws. Yet there is something that the older and newer sorts of progressives have in common, particularly in America, and that is a strong inclination to pacifism. On the eve of the First World War, there were lots of progressive-minded people who believed that war was an outmoded relic of man’s primitive past. When Andrew Carnegie left his fortune to the Carnegie Endowment for World Peace, he stipulated that, once war had been forever banished from the face of the earth in keeping with his testamentary instructions, the money could then be applied to subsequent and lesser utopian projects. Yet when it came, the industrial-scale slaughter of the Great War, so far from revealing the chimerical nature of the pacifist dream, only made the progressive-minded redouble their efforts to make it what some of them had taken to calling "the war to end war." Progressive ideas of the period included the League of Nations and the Kellogg-Briand Pact of 1928 — a Franco-American agreement to outlaw war which was signed by all the future belligerents of the even bigger World War that was to begin eleven years later. Kellogg-Briand is still in effect, and still has as little effect, today. It may not have succeeded in preventing any of the hundreds of wars there have been since then, but it has done something, you’ll be glad to know, to prevent politicians from calling them wars. War movies — like movies in general — have their beginnings in this period of hopeful pacifism and showed the impress of it almost from the beginning. Even thrilling depictions of aerial combat like Wings of 1927, the first winner of an Academy Award for Best Picture, stresses the pathos of the hero’s killing his best friend by accident — a glancing allusion to the fratricidal nature of armed conflict which, in one way or another, was to become one of the clichés of the genre, from the letters found by Lew Ayres on the Frenchman he has killed in All Quiet on the Western Front of 1930 to Robert Ryan’s discovery of a photo of a dead North Korean’s wife and child in Men in War of 1957 right down to Clint Eastwood’s neat reversal of the trope in Letters from Iwo Jima of 2006. There it is a Japanese soldier who marvels, on hearing read out to him a letter found on a dead American from his mother, how much it sounds like the things his own mother has written. Even at their most patriotic and pro-war, as in Sergeant York of 1941, American war movies often had some such strain of pacifism. More than half of Sergeant York is devoted to persuading Gary Cooper’s Alvin York, a religious pacifist living in the mountains of Tennessee, why it is right for him to abandon his beliefs and fight for his country in World War I. Alan Ladd, playing a Quaker, has to learn the same lesson in The Deep Six of 1958. More often, the hero receives a reminder of the humanity of the enemy — like the photo in Men in War, which I just mentioned. Also in that movie, Robert Ryan says to the trigger happy sergeant played by Aldo Ray, "God help us if it takes your kind to win this war" — though in the end it rather seems as if it does take his kind. Interestingly, Ryan also appeared as a stuffed-shirt colonel ten years later in The Dirty Dozen, a movie whose whole point was that not only did we need such men but much, much worse ones — violent criminals, in fact — to win our wars for us. And this was true even of what we now call "the good war" against Naziism. Up until that time in the war movies of the post-World War II era it was normal to be reminded that it was not quite proper behavior for good Americans to be too enthusiastic about killing. War was then a solemn business and, for at least so long as audiences accepted it as axiomatic that American soldiers were the good guys, they also showed traces of the old progressive and pacifistic view that there is something rather shamefully retro about the taking of human life in the name of one’s country, even when the movie audience is expected to think it necessary. But then along came the Vietnam war and, with it, the new progressives for whom (remember?) American soldiers are pretty much axiomatically the imperialist bad guys. The anti-war movement included both old-school pacifists and those who openly sympathized with the Communist enemy, seeing their own country in the Althusserian way as imperialist oppressors, but it was the latter tendency, I think, who were ultimately more influential in Hollywood, as they have also been in the rarefied world of film studies. Interestingly, this doesn’t mean that the movies of the post-Vietnam era all became left wing, though some of them did. More often, they welcomed the G.I. — now renamed the "grunt" — into a fellowship of victimhood with the innocents he had been called upon to slaughter. This they did by further widening the gap which already existed between soldiers on the ground and the superior officers and politicians who had ordered them into battle. 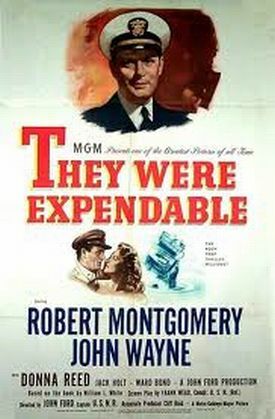 To illustrate what I mean, I’d like to compare John Ford’s They Were Expendable, which many of you saw last night, to two meat-themed movies of the later post-war period: Pork Chop Hill of 1959 and Hamburger Hill of 1987, about the Korean and Vietnam wars, respectively. All three show us war from the ordinary soldier’s (or sailor’s) point of view — that is to say, from a perspective which makes it very difficult to see and understand the thinking of those higher up in the military-political hierarchy from which orders are handed down. As we saw in They Were Expendable, the men were given orders they didn’t like and that made no sense to them. But not only did they carry them out without question, they trusted their superiors to know better than they did. The sailors in the movie were all proud to have been chosen to take General MacArthur on the first leg of his journey out of the hell of Bataan and Corregidor to Australia, even though they knew this meant that, though they were expendable, he wasn’t. 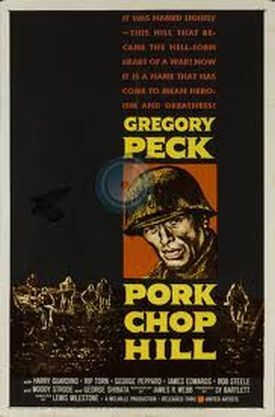 In Pork Chop Hill, the superior officers were shown bickering with their Chinese and North Korean counterparts at the peace talks in Panmunjom and ordering the platoon commanded by Gregory Peck’s Lt. Clemons to take a hill with no strategic or military value — a hill which costs the lives of most of his men — just because the Chinese had taken it first and it was seen as a bargaining chip. There, there is little or no overt criticism of the generals or politicians, and — spoiler alert! — Gregory Peck himself is rescued in the end by the reinforcements he had been told he wouldn’t be getting. But the unspoken resentment of his character towards those who had needlessly sacrificed his men was made clear. In Hamburger Hill there are no superiors visible to us. It is simply assumed that charging up the hill into murderous enemy fire has no purpose we can understand any more than the men ordered to do it understand it. The chant that is adopted by the black soldiers at one point later becomes the catch-phrase of the movie: "It don’t mean nothin’, man; not a thing." As in the other two films, there is meant to be an honor to these brave men for doing what they are ordered to do even though it makes no sense. Like Tennyson’s Light Brigade: "Theirs not to reason why/Theirs but to do or die." As the French General Bosquet who witnessed the original charge at the Battle of Balaclava in the Crimean War is supposed to have said, "It’s magnificent, but it’s not war. It’s madness." Now war is madness. All war amounts to a mindless blunder like the Charge of the Light Brigade. 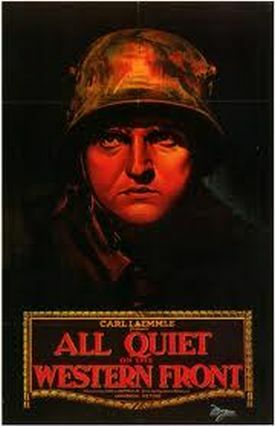 We can compare another couple of pictures to illustrate further, the original All Quiet on the Western Front of 1930 directed by Lewis Milestone — who later went on to direct Pork Chop Hill — and the remake of 1979 by Delbert Mann. Both movies are anti-war, but where Milestone’s tells us that the immense sacrifice of the First World War wasn’t worth it, Mann’s tells us that it couldn’t have been worth it. The later version came out in the same year as Apocalypse Now and, like it but unlike the earlier version, sought to convey a sense of the insanity of war by showing war as insane behavior — a thing which, as it turns out, is quite easy to do. Mann’s All Quiet, for example, begins with a scene depicting a blind charge by the French into withering German fire, followed by a retreat by the few of them who remain alive. This is then immediately followed by a blind charge by the same Germans who have killed so many of these suicidal Frenchmen, into withering French fire before the few of them remaining retreat in their turn. Anyone can see how pointless it all is — or anyone except the people who, for some insane reason, must have thought it a good idea at the time. The movie isn’t really interested in them. But these twin charges then become the synecdoche for the whole war. After that, you don’t have to watch the rest of the film, since you know it will all be like this. There is nothing but the pathos of youthful innocence forced by social pressure into suicidal behavior — and actual suicide — for no discernable reason. That is also, of course, the hallmark of so many of the Vietnam War movies that were coming out at about the same time. The Deer Hunter even departed from the actual American experience in Vietnam so far as to invent a fictional Vietnamese underworld of men, including one tragic young American who played Russian roulette for kicks, presumably as their own symbolic commentary on the reduction of the American military effort to sheer emotional thrill-seeking. Apocalypse Now as well as Platoon, Full Metal Jacket and other Vietnam War films also promoted the idea that not only that war but war in general was a form of insanity. To return to The New York Times, for a moment, there is a certain irony in Mark Boal’s taking consolation from the fate of a movie like Apocalypse Now. Miss Ryzik’s assumption that Francis Ford Coppola’s film has been vindicated by history must be based partly on the fact that the anti-war view of Vietnam is now, apart from a few outliers like Mark Moyar and Stephen Morris, the consensus among historians as well as film scholars and political philosophers. Surely, that consensus would have to be comprehensively re-negotiated and the course of history itself altered if "history" is ever to have anything nice to say about a movie like Zero Dark Thirty. That’s because its portrayal of American intervention in Afghanistan is allowed to track too closely with the anti-war movies which saw American intervention in Vietnam as a matter of imperialist oppression of indigenous innocents. For the questions raised by Zero Dark Thirty to be taken seriously, we might even need to abandon the wider cultural consensus about the idea promoted by the Vietnam-era movies of war as insanity. I’m sorry to report that there seems at present little chance of that’s happening. 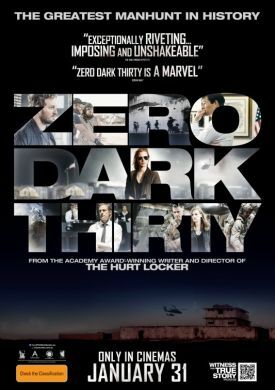 Zero Dark Thirty is itself not untouched by this view of the insanity of wars and those who make them, and The Hurt Locker, the previous collaboration between Mr Boal and Kathryn Bigelow, the film’s director, won the Best Picture award three years ago in part, I think, because it had found a somewhat new way of saying the same thing. Both movies focus on one aspect of one kind of war, formerly known as "the war on terror," which may be considered, if you look at it in just the right way, as not futile. In Zero Dark Thirty it is the effort to bring to justice a sort of supervillain, Osama bin Laden, regarded more as a criminal mastermind than an enemy combatant. Collateral damage in the movie, at least of the kind inflicted by our side, is pretty much limited to some pretty mild torture, as torture goes, visited by the CIA on just one hapless jihadi. And the film questions even whether that much suffering, though caused by our efforts to get Osama, is worth it. The fact that these torture scenes are all that so many people seem to have noticed about the movie as well as being almost certainly the reason why it was all but shut out of the Oscars — it tied for Best Sound Editing with Skyfall — after having been nominated for five awards, including Best Picture, suggests that our culture is becoming more and more intolerant of those who might have anything good to say about the uses of organized violence to which the new progressive view is reflexively opposed. It’s not as if Miss Bigelow and Mr Boal don’t know this, of course. In Hurt Locker, they got around the politically correct view of the Iraq War by giving us a portrait of a fictional American hero of that war, played by Jeremy Renner, who was a hero not for killing — though he did a bit of that too, perhaps to add verisimilitude — but for saving lives, including the lives of women and children, UN officials and an innocent Iraqi tethered to a bomb by some Osama bin Laden wannabes. But Mr Renner’s character, a bomb disposal expert named Sgt William James, was really more of a first responder than a soldier. He was made to appear more interesting to us by being shown as having a measure of the insanity we have lately learned to expect from soldiers suffering from the stress of combat. In his case it takes the form of an addiction to danger not altogether unlike that of the players of the suicide game in The Deer Hunter. The Sergeant’s fellow soldiers, likely to suffer unpleasant consequences from it, remark on his crazy bravery and deplore it. Thus the camaraderie which is so much a feature of the traditional war movie sort of drops out of The Hurt Locker. Sgt James is isolated even from the other members of his team — who accuse him of being an adrenalin junkie trying to get them killed — as he has already been isolated from the rest of the American forces in Iraq. They may be off promoting American imperialism for all he knows, while he is busy saving lives. This makes him a cool hero, almost a superhero — that adolescent fantasy figure who became as much a Hollywood staple as the war movie itself used to be, during the years of the war movie’s decline. I’ll have some more to say about superheroes in a few minutes, but the essential thing about them is their isolation. The world around them, as we see above all in the Dark Knight trilogy of Christopher Nolan, is irredeemably corrupt and keeps threatening to drag Batman, too, into its moral morass. The superhero’s heroism thus lies at least partly in his ability to remain aloof from the too obviously non-super world around him. The same is true of Sgt James, whose return stateside comes to seem to him more insane than the insanity of the war to which he, therefore, returns. Of course there can be no pretense that he is a fair representative of the American combat soldier who, previously, movie-makers thought it their business to portray. The cost of his heroism, like that of the superhero, is its dissociation from any larger purposes that the American forces of which he is ostensibly a part may have. The movies have long since established that there can be no such purposes, or none that are creditable to America anyway. But because the war itself is crazy, it helps his own craziness look like heroism. A friend of mine has objected that Sgt. James’s multiple flirtations with violent death are only a new and exciting way of portraying the sort of military temperament we can see in Robert E. Lee’s words to General Longstreet: "It is well that war is so terrible, or we would grow too fond of it." But even apart from the fact that this is a warning against over-fondness for war, it does not strike me as the remark of an addict in need of his adrenalin fix. It is, rather, what we might expect from a master craftsman who enjoys doing what he is extremely good at doing — while at the same time putting that feeling of enjoyment into a context which shows that he is aware of the human cost to others. A better example of an American general out of the past with an excessive love of war is George S. Patton, or at least the version of him portrayed by George C. Scott in Franklin J. Schaffner’s Patton of 1970. Scott’s Patton says of war: "I love it. God help me I do love it so. I love it more than my life." I have not been able to discover if the historical Patton ever said this, but the sentiments of the movie Patton came along at exactly the right historical moment to match up with the insanity of warfare as depicted in movies like M*A*S*H, Catch-22 and Kelly’s Heroes, all of which also came out in 1970. This was the year of the Cambodian "incursion" by U.S. forces, and the reaction at Kent State and other college campuses — the height, that is, of both the Vietnam War and the protests against it. The portrait of the American military establishment in The Dirty Dozen that I mentioned earlier was beginning to be cemented in place and now owed something to the theatre of the Absurd — which, like Dada, had been an outgrowth of the First World War, in which there was a revival of interest during the 1960s. In Britain Joan Littlewood’s musical comedy revue, Oh! What a Lovely War from the earlier part of the decade was made into a movie in 1969. Some of the same absurdist humor had informed Dr Strangelove of 1964, and there were elements of it in the otherwise serious movies Manchurian Candidate of 1962 and The Great Escape of 1963. The latter film may have helped to open a path to the comic TV Nazis of "Hogan’s Heroes," which started its six-year run in 1965. Such movies looked forward to a break with the American tradition of portraying our fighting men as reluctant but dedicated to a cause — even if, as in the case of many World War II movies, the cause was simply getting the job done and getting back home again. Within a few years, they were expected to be more or less crazy because war itself was crazy. In a spate of post-Vietnam movies American soldiers were portrayed as trigger-happy cowboys who might have been conceived to gratify the prejudices of the Louis Althussers of the world if they weren’t also meant to be seen as victims of war’s insanity. By the time we get to Quentin Tarantino’s Inglorious Bastards of 2009 — the same year as The Hurt Locker — viewers are apparently meant to be proud of our soldiers for being psychopathic killers who get a thrill from their work — and are expected to give us one too. We are invited to indulge our pleasure in horrific scenes of violence because the victims are Nazis, just as those in Mr Tarantino’s most recent film, Django Unchained, for which he won an Oscar for Best Original Screenplay, are slave-owners in pre-Civil War America. Such people can be safely dehumanized as they dehumanized the Jews and the slaves, respectively, and those moments of regret and pathos that used to be built into Hollywood’s depictions of killing in war now must seem corny and out of date. That may be why Clint Eastwood only risked one with an enemy soldier in Letters from Iwo Jima. In the same way, perhaps, the sympathetic Japanese officer in that film played by Ken Watanabe is allowed to mention — and to question — his sense of honor, as one can hardly imagine an American soldier’s doing anymore. The companion piece to that film, also directed by Clint Eastwood and showing Iwo Jima from the American side, was called Flags of Our Fathers and dealt with the raising of the American flag on Mt Suribachi in the now iconic photograph. But its only purpose was to portray three of the flag-raisers, sent on a war bond tour around the country, as victims — victims not only of some kind of post-traumatic stress disorder (even though that illness was unknown to medical science at the time) but also of the unthinking and unfeeling behavior of the civilians back at home who had made heroes out of them but who had no idea of the costs of their heroism. The combat in this film consists of chaotic scenes of confusion, suffering and death, many in nightmarish flashbacks that stress their subjective and emotional nature, of which it is impossible for the viewer to make any sense. The faith in linear narrative that was the literary counterpart of the Victorians’ false belief in progress has of course long gone, leaving behind only the assurance of war’s insanity. There is no longer any story to tell about the war itself, no identification of an objective — like the farm house in A Walk in the Sun (1945) or the hill which becomes an objective even for men in retreat in Men in War — and then an account of how a group of soldiers went about taking it. The only story is a non-linear one: a recurring series of pathological reactions to psychological and emotional suffering caused by the experience of fear and death in war. Just as Patton projected the "Whoopee, we’re all going to die" absurdist sensibility of 1970 back onto World War II, so the two Eastwood films project onto that war the two later strands of progressive thinking characteristic of the post-Vietnam era: the weakness, corruption and detachment of political authority from the military victims it has abandoned — something we see especially in the Rambo movies — and the psychic damage sustained by soldiers forced to fight and die for no good or rational purpose. The absence of a good or rational purpose to American military actions and deployments has become an article of progressive faith and is the reason why Zero Dark Thirty has come in for such savage criticism. If the killing of Osama bin Laden can be grudgingly admitted as a rational response to the terror attacks of 9/11, the use of torture as a rational or even an effective means of bringing it about cannot. The victimization of non-American, non-European "people of color" (as we are now taught to call them) in the pursuit of America’s hegemonic purposes is bad by definition. That was established by the Vietnam movies. 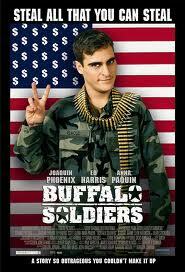 The fate of a really bad movie called Buffalo Soldiers might be instructive in this connection. Scheduled to be released in the fall of 2001, it was put on the shelf after 9/11 because it had portrayed a Cold War era U.S. Army base in Germany as nothing but a gang of thieves and thugs — the Dirty Dozen gone mainstream and without any mission to perform. They are led by careerist officers who are either corrupt themselves or have no idea of what is going on among the men under their command. Technically, this wasn’t a war movie, but it relied for such credibility as it had on the earlier portraits of the Vietnam-era military, crazed into violence and criminality by the alleged insanity of their mission. I would like to think that the delay in releasing Buffalo Soldiers was owing to at least a slight sense of shame about the urge to continue propagating such slanderous stuff when young Americans were risking their lives for their country in Afghanistan. If so it wasn’t strong enough to prevent its eventual release in 2003, four months into the Iraq war, as a precursor to the spate of antiwar films that was to follow during the remaining years of the Bush administration. These movies often seemed to have little to do with what was actually happening in the war, or to have little interest in anything about it except that which provided the occasion for picking up leftover themes from the Vietnam War movies — government and military cover-ups of atrocities, betrayals of ordinary soldiers by higher-ups, the psychic damage experienced by men — and, now, women too — by the experience of combat. They included Home of the Brave In the Valley of Elah, Lions for Lambs, Redacted, Stop-Loss, The Lucky Ones, Brothers, Green Zone and others, as well as TV shows like Generation Kill and documentaries like Gunner Palace and Restrepo. All are, of course, anti-war, since that has been the Hollywood default for more than a generation, in spite of a sub-genre of what have been called "Greatest Generation movies" that came out mostly in the 1990s. These included not only pictures like Memphis Belle, Saving Private Ryan and Pearl Harbor or TV shows like Band of Brothers, but also pious tributes to the warriors of other wars in the past, from medieval times (Braveheart) to the Revolutionary War (The Patriot), to the Napoleonic wars (Master and Commander) to the Civil War (Gettysburg and Gods and Generals) to Somalia in 1993 (Black Hawk Down) and even to Vietnam before it was insane (We Were Soldiers). But these existed alongside even more films that were obviously derivative from the Vietnam movies of a decade or so earlier and that blasted the American armed services for racism (Hart’s War) or sexism (G.I. Jane, Courage Under Fire, The General’s Daughter) or straightforward criminality (A Few Good Men). Sometimes, as in The Rock of 1996, there is a residual sympathy for the military bad guy — in that case an Air Force general played by Ed Harris — because he suffers the scars of war himself or is only threatening to commit criminal acts of terrorism because he thinks the government has been insufficiently solicitous towards its veterans, which recalls the Rambo films and their sharp distinction between victimized soldiers and victimizing politicians. That has been the one safe way to be pro-military since the 1970s. Even in some of the ostensibly pro-war films of this period, however, there were often traces remaining of what we might call the Vietnam syndrome. 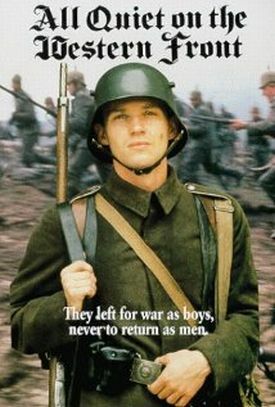 In Saving Private Ryan, for example, one of the men on the rescue mission to bring back to safety the last survivor of the four sons of a bereaved mother in Iowa, says to the others: "Maybe saving Private Ryan was the one decent thing we managed to pull out of this whole godawful mess" — the godawful mess being, presumably, the war for freedom and against Naziism in Europe. There the World War II setting cannot still the echoes of the post-Vietnam syndrome for which all wars are godawful messes by definition. Like the Vietnam veterans Chuck Hagel and John Kerry, that is, this guy finds it natural to assume the futility of war. Even in Ridley Scott’s Black Hawk Down of 2001, which Liane Tanguay identifies as "the aesthetics of hegemony at its cinematic best" — she doesn’t mean that as a compliment, by the way — and which the New York Times reviewer referred to as "incoherent militaristic propaganda," the moral climax comes when a soldier says: "Once that first bullet goes past your head, politics and all that s*** just goes right out the window." War, that is, may or may not be futile, but when you are in it you don’t even think about such things. The people back at home, this man tells us, "don't understand why we do it . . .They don't understand it’s about the men next to you. That’s all it is." It is a sentiment that has been heard from many other soldiers in many other wars, but it is also a way of remaining agnostic about the central truth of the post-Vietnam sensibility, which starts from the assumption that war is a kind of madness when it is not a kind of crime. So, too, in The Patriot, Mel Gibson shows an atrocity actually committed by the SS in France in 1944 being perpetrated by the British against American colonists when a high-ranking officer orders civilians, including women and children, to be herded into a church before locking the doors and burning it to the ground. Like Inglorious Bastards, The Patriot seems to have found the legacy of World War II useful mainly because it establishes a precedent for treating any and every enemy as the moral equivalent of the Nazis and therefore unworthy of humane consideration. To be sure, war movies have always had to be sparing with glimpses into the humanity of the enemy. Just as soldiers have had to be. It would be impossible for them to do their job otherwise. 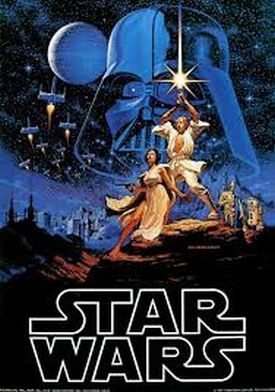 But the cartoonish quality to the bad guys in many recent films must owe something to a more generally cartoonish vision of human life and conflict that goes back to another product of the anti-war 1970s, namely Star Wars. One way, that is, to go on making war movies when war has been given such a bad name by the politically correct is to transport the action to a galaxy far away and to dehumanize the enemy by putting him in a mask or other disguise or turning him into a virtual if not an actual robot, like George Lucas’s imperial storm troopers. War fought in the air, whose history also begins at the same time as the movies’, has always been a bit of a special case and to some extent exempted from the truism about war as insanity, and war fought in interplanetary space must obviously benefit from the same dispensation. There is a paradox here that we are seeing played out in real life in the debate over drone warfare. The more remote we are from those we kill, the less like killing it seems to us and therefore the less subject to moral consideration. Who thinks, when Luke destroys the Death Star, of the vast human tragedy it must represent for those inside it? They’re no more worthy of our consideration than Quentin Tarantino’s Nazis and slave-owners, but their deaths are also mostly out of sight and therefore out of mind. As Stalin is supposed to have said, one death is a tragedy, a million deaths is a statistic. The distancing of the viewer from the carnage is thus of multiple kinds: in space, in time and in terms of an absence of any shared humanity with nearly all of war’s victims. But at least the Star Wars wars are not pointless or imperialistic. In fact, our heroes are imagined as rebels against the imperial forces and therefore on the side of goodness as Americans, in the view of the new progressives, can hardly be any longer when they take up arms. I believe, however, that there is a cost to this way of finding new warrior heroes, and it is the descent into fantasy. Just as Luke and Leia and Han Solo are remote from their victims, so they are remote from us, just like superheroes. And, also like superheroes, they perform incredible feats that further underscore their distance from us and, indeed, from anything in the real world. Movies themselves have become cartoonish even when, as in the case of Quentin Tarantino’s, they are ostensibly set in the real world. Partly this is a matter of the demographics of the movie marketplace. Grownups are hugely outnumbered in the cineplexes and multiplexes of today by teenagers, and so most of the movies that come there are made for teenagers. And the more they are made for teenagers, the more it is only teenagers, who like cartoons, who come out to see them. Grownups, if they see them at all, see them on DVD months or years later. Otherwise they watch TV, and TV now tends to offer much better and much more grown-up fare than the movies do. But even there, even in the "Greatest Generation" movies and TV shows, we are nearly always kept by the new progressive brand of pacifism at a distance from what we are seeing on the screen, either because it is remote in time or because, like Lord of the Rings, it is a part of the cartoon fantasy world made for childish tastes, if not always for children. I think that’s why Zero Dark Thirty came in for such a savage attack from the guardians of the new progressive consensus: because it threatened to find a way to bring cinematic warfare back into something resembling the real world whence — so the new progressives feel confident "history" tells them — it is soon to be banished. That’s the biggest fantasy of all.